Please select a date below for more details. To truly experience the program and destination, you need to be able to participate in physical activities such as longer walking tours, walking over uneven terrain, climbing stairs and periods of standing. Some of the touring days may be longer, with select included activities occurring later in the evening. This tour is very active, requiring participants to be physically fit to fully enjoy all the experiences. This itinerary has more strenuous activities which may include such things as: extensive walking tours, transfers over uneven and dusty terrain, high altitudes, early morning departures, late night activities, or extreme temperatures. All conditions do not apply to all days, so please read the itinerary carefully and speak to one of our travel counselors to determine if this tour is right for you. We recommend this program to individuals who are physically fit. Unfortunately, this tour is not appropriate for individuals who use either walkers or wheelchairs. If this trip is not ideally suited for you, our travel counselors can help determine the perfect trip for you. I think they are a good tour company and try to do the best for their customers. Sorry, due to a medical emergency - did not get to finish the tour but we are going to go back. Reservations were all handled through our chamber of commerce, Any questions that I had were handled by them. Enjoyed everything except the farm visit. I felt there were other things we could have done in the place of that. Tour guide not personable. There was nothing to do the First day at the castle except wait 5 hours for a room. Thank you for traveling with Collette to Ireland. Your feedback will be reviewed by the Tour Management and Product Design Teams in order to enhance the overall quality of our tours. Great trip. Would have liked the two days in Dublin at beginning of trip when we sera’s tired. Everything was top notch. Will definitely use Collette again. Absolutely wonderful. Can’t wait until our next trip. The tour,accommodations, and our guide were excellent. The entire package was terrific. Lovely accommodations, knowledgeable and helpful tour guide, and gorgeous scenery all made for a marvelous trip. The other people on the tour were polite and friendly. All aspects of the trip were equally memorable. My sister and I loved our time in Ireland. The trip was planned perfectly! Can't wait to have another tour with Collette! loved our time in Ireland!! Collette is outstanding. They provide an excellent itenarary, everyone was pleasant, and the accommodations were the best. I would travel with Collette again, and I have recommended them to others. Our tour director was very knowledgeable. Our driver was an expert. The entire trip was a great learning experience. Beautiful scenery, excellent food, and wonderful experiences with the culture of Ireland. Every part of the Collette tour to Ireland was wonderful. We took a group of 25 from our senior center. The hotels were beautiful and comfortable. The tour guides and the tour manager and bus driver were first class. one of my favorite experiences was touring the Irish Dairy farm and listening to stories of the owner of the farm. We saw a true picture of what the lives of the Irish is like. The Patriarch of the family had so many wonderful stories. One optional tour - to the restaurant in Dublin owned by U2 was really hyped up and it not meet with how it was described. We didn't have much opportunity to spend time in pubs and to hear the Irish music. the pick up service was great as was the tour guide Sean. very knowledgeable and helpful. Magnificant to say the least! We were extremely pleased by the trip. The tour guide, tour, food, and entertainment was superb! There isn't anything negative about the trip, except it ended too fast. Everything went as scheduled in our itinerary. The weather was ideal, and the stop at a dairy farm was very nice. I have traveled with Collette many times. I have never been disappointed. They take you to the best places, whether it's the hotels or the tourist attractions. The tour guides are knowledgeable and professional. It would take too long to write about what was bad about this tour. I will be writing Collette a long letter! It would take more space than what you are providing. Thank you for traveling with Collette to Ireland. When your feedback is received and processed a member of the Guest Relations Team will be reaching out to review your comments. I felt that the locations that we visited and the amount of time spent in each was spot on! EVERYONE was respectful and polite and friendly. I also enjoyed the free time which was spent by opting out of two “extra” group dinners. Our guide suggested eateries for us since we weren’t going with the group and these places were excellent. I’d 100% go in a tour with Collette again. I lived the Blarney Castle. The time of this tour was slightly off season so there were NO crowds which made for a perfect experience. Our Irish Splendor tour was amazing! I would and have recommended Collette to others. The experience was great. We had all of our info in plenty of time, including a nice packet with flight info, luggage tags,bags etc. our tour manager Erin was amazing! Great fun for our group of 4. Collette provides great service, so I can travel without having to worry about the details. Hotels, meals, and transportation were taken care of. The tour guide on my Irish Splendor trip, Colette Dennison, was very knowledgeable and entertaining, and she was able to keep a crowd of sometimes challenging people in line with her great sense of humor and professional composure. Our driver was excellent and kept the coach in great shape. Fast-paced, but very enjoyable. We saw a lot of Ireland in 6 days. My favorite place was Dingle and Inch Beach - so beautiful! A must do on your Bucket List!! Yes, it was a wonderful trip. Saw all of the highlights and left me wanting more time in Ireland. Well planned and made good use of our time. You need to have tour guides that are friendly, accommodating and native. Tour guides drive the experience. Again the tour guide drove the experience. Going to the farm was a wasted day. Thank you for traveling with Collette to Ireland. A member of the Guest Relations Team will be reaching out to discuss your feedback. Great value for the price. The pace was just right with a good balance of planned activities with free time. Great tour guides & nice drivers... go to the places you want to see & do..great value.. have some free time included..
Hard to choose but Blarney Castle & kissing Blarney Stone. 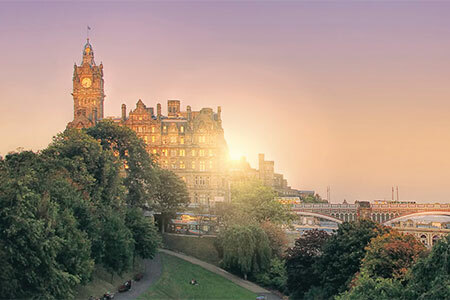 Very good tour itinerary with nice hotels. I was disappointed that this groups of travelers, only 24 of us, never really "gelled" like other group tours I've experienced. Perhaps because the tour guide never allowed a time for travelers to introduce themselves to the group. And because this is a relatively short trip, most of us were just getting to know each other by the time the tour ended. This was a disappointment because on other trips I've returned home feeling happy about new friendships. In fact, as a result of a Collette trip I took three years ago, I communicate regularly with three sisters who became very good friends on the trip. The breakfasts provided at the hotels were generally quite good. The lunches/dinners provided as part of the tour were sub-par, I felt. I was especially disappointed in the dinner at Cabra Castle. I guess I expected something a little special of a castle meal. It was not always made clear to us when a beverage (beer/wine) was included. On at least one occasion we were surprised when presented with a bill. Our flights in both directions on American Airlines were a nightmare, being two hours late both ways, which resulted in us being absolutely exhausted upon arrival and choosing not to do any sightseeing in Dublin. The dinner entree on the trip to Ireland was just about inedible. We probably will not take a future Collette trip if it means flying on American Airlines. Despite some of these disappointments, the tour itinerary was very good and I especially enjoyed the Dingle Peninsula. I loved the drive around the Dingle Peninsula. Hello, Gretchen! Thanks for all your great feedback. We have passed it along to our team members for consideration. We hope to travel with you again soon! The accommodations and food was good. The bus driver was excellent. The tour director was knowledgeable, friendly, and polite. His accent was regional but also understandable. There were not enough planned evening activities but the days were full and enjoyable. The only reason I would not recommend Collette is that I make it a rule to avoid recommending anything that is subjective to individual taste. I enjoyed the tour very much. The Clipffs of Moher were spectacular. Same comments as previous. From **** at the wheel to ****our guide - along with every hotel, restaurant and tour in between - every single thing was outstanding. We could not have been more please. Our only complaint was that we'd wish it was 2 nights at each destination. Living from a suitcase is really not for us - but we'd definitely book with Colette again if we found a longer tour we were interested in. It was truly a wonderfully memorable week. While every stop was amazing, I think Margaret and Padfy's farm was wonderful and Cabra castle was a jaw dropping, fabulous experience. The whole experience was an absolute pleasure. Collette's dedication to the whole ordeal made it happen. All the activities planned gave me a worthwhile experience. A smaller tour or age appropriate tour would have been more enjoyable. The destinations were wonderful. The restaurants were great! The first Hotel The Ashling was a bit disappointing. The bed was not comfortable along with the pillows and the carpet was very used/old looking. Also the size of the tour of 44 with more than 20 seniors substantially slowed us down. Most memorable was Dingle Peninsula. Breathtaking views and scenery! My daughter,and I had an excellent experience with with our. Irish splendor tour our tour manager as well as our driver were superb.Yes I would definitely refer customer to Collette (tour company) for their next journey. The knowledge our tour guide had and sightseeing were breathtaking. Fast paced covered a lot of Ireland. Great experience for see both coast of the country. Plan to go Northern Ireland with Collette next. Oh my gosh, it's hard to provide just one. Visiting with Patty and Margaret at their home was absolutely lovely. When the Spotlight tour we were interested in was cancelled they offered us a different tour at the same price. All of our questions from the time of booking to our departure were clearly answered. Our tour guide, (personal details removed by Feefo), was excellent and because of her commentary we were able to better appreciate what we were seeing and experiencing. What prevented me from giving a 5 rating was our disappointment in not being able to see central Dublin due to St Patrick's Day activities. Wonderful way to see Ireland! I would definitely use Collette's service again and I would definitely recommend them to others. I felt that our tour was very professionally managed and we were able to enjoy our trip in the best way possible thanks to Collette. Excellent hotels, tours, meals, coach bus and driver and our tour guide were the best. We enjoyed all the locations we visited. Just the right amount of time in Dublin. The city tour of Dublin was perfect - knowledgeable city guide and in depth visits to two sights, St. Patrick's Cathedral and the Guinness Factory. Well organized. Interesting sights. Knowledgeable tour manager. Good hotels and good food. Unexpected delightful activity at Dromoland Castle....hawk walk!! Thanks for a great trip! Dingle peninsula was beautiful; Cliffs of Moher fabulous, the Castle glorious, the beer and whiskey distillers not so. Very organized, informative, beautiful scenery. Enjoyed! Dronoland castle, the Cliffs, the people, so friendly. Great tour guide. Super bus driver. Excellent company. Too much focus on shopping. But that's probably just me as most of the women appeared gun ho for the shopping. michael ,the tour guide was knowledgable about the history and current culture .a great organizer ,never missed a thing. 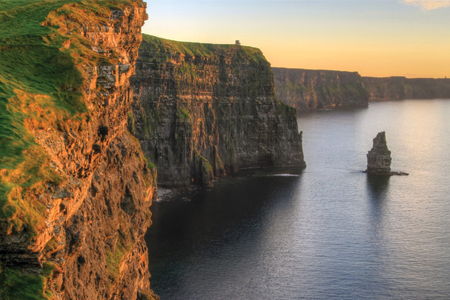 Savor a true taste of “Irish Splendor.” From the breathtaking sights of Kerry to the historic Rock of Cashel, gaze across the countryside and culture of Ireland. Set out on our most popular Irish adventure. Experience all of the charms of this enchanted country, including its welcoming people. 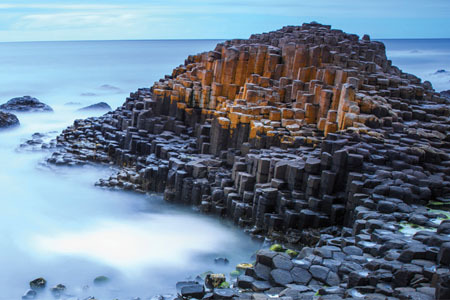 Bask in the warm Celtic culture and majestic scenery on a tour of Ireland and Scotland that combines the best of two remarkable lands. Visit Ireland and have rollicking fun as you journey along some of the world's most scenic roads set beside emerald green rolling hills. Cross the Irish Sea and travel through England, Ireland, Scotland and Wales. 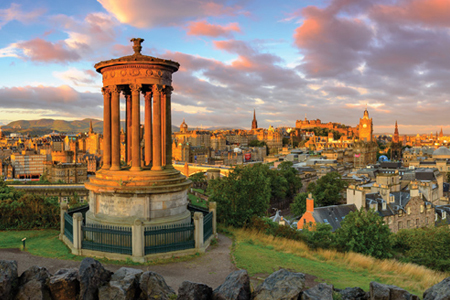 This great adventure takes you to the most fashionable cities and historic places. This tour requires average physical activity. You should be in good health, able to climb stairs and walk reasonable distances, possibly over uneven grounds and cobblestone streets. Days of features are interchangeable. Air passengers will arrive into and depart from Dublin airport. All transfers will arrive into and depart from Dublin airport. To complete your tour, we include roundtrip airport-to-hotel transfers when purchasing our airfare with your tour. If you have arranged for your own air, we are pleased to provide you the option of purchasing these transfers. Please note that all transfers will leave at pre-scheduled times. On day 8, due to flight schedules, you may require an early morning departure from your hotel. Return flights should not be booked prior to 8:30 a.m.